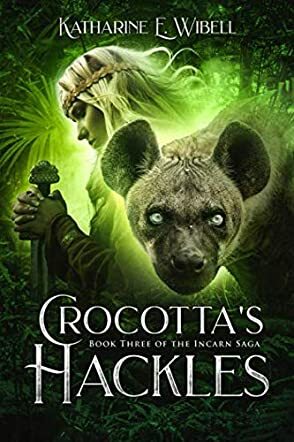 A twisty young adult fantasy, Crocotta's Hackles by Katharine E. Wibell is an interesting third entry in The Incarn Saga, featuring a splintering kingdom and a young heroine on an impossible mission. It’s a narrative that blends legend with the action of the present to define the path of a lovely protagonist and a conflict that has developed from time immemorial. According to legend, the queen of the gods, Crocotta, moved to anger by the infidelity of her lover, decided to prevent similar cases of infidelity in the future. However, the act of infidelity resulted in the birth of a warrior goddess who eventually became her nemesis. When the kingdom of Elysia is threatened by the Raiders, Lluava embarks on a mission to locate other Incarns and get help. What happens next will grip readers. This is a narrative with a complex and engrossing plot. Katharine E. Wibell’s richly developed characters and her profuse imagination will hit readers strongly. The prose is elegant, the entire narrative filled with beautiful images of the setting. The author writes scenes that are emotionally rich and focused. What hit me most is the manner in which she melds legendary times with contemporary characters. Lluava is a teenager unlike any other and I enjoyed the fact that her development as a person and as a character isn’t at its peak when the story starts. She has to discover her strength, find out more about who she really is, and progressively learn to accept her destiny. Crocotta's Hackles is sophisticated, narrated in an absorbing voice and in language that is, in itself, delightful.